Infographic: Who isn't getting vaccinated in Arizona? As measles cases in Arizona worry many people, Codie Athey said she doesn’t have to be concerned about her kids, ages 6 and 10, because they’re immunized. But she said she fears for others with children attending Camp Verde Elementary School, where state records show that one out of five kindergartners weren’t fully immunized against measles, mumps and rubella during the 2013-2014 school year. With immunization rates falling in recent years, health officials warn that some schools and areas have lost the level of vaccination required for the herd immunity needed to prevent disease outbreaks. About 94 percent of kindergartners were fully immunized for MMR last school year, according to Arizona Department of Health Services data. In Yavapai County, that figure was 86.8 percent, second lowest in the state behind Coconino County, with 86.3 percent. 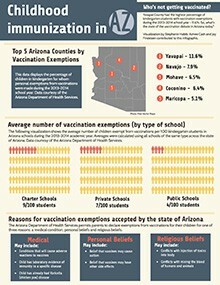 Arizona is among a minority of states allowing parents to opt out of school immunization requirements for philosophical or personal reasons as well as medical or religious reasons. For the state as whole, 4.7 percent of parents claimed a personal-beliefs exemption in 2013-2014; for Yavapai County, the figure was 11.6 percent, highest in the state. Schools in the Yavapai County communities of Prescott and Cottonwood also have some of the state’s highest personal-beliefs exemption rates. 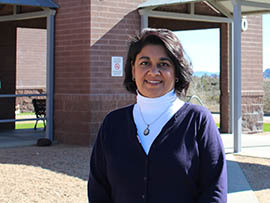 Dr. Yamini Goswami, public health medical director of Yavapai County Community Health Services, said families with higher incomes and children in charter or private schools have higher personal-beliefs exemption rates than any other demographic group in Yavapai County. “Even though there have been numerous studies that prove they’re … more of a benefit than a harm, there are parents that tend to focus more on the risks rather than the benefits,” she said. Goswami said a vaccination rate of 92 percent to 94 percent vaccination rate will protect children who can’t be vaccinated, including those who are too young to be immunized. Stephanie Purinton, a certified nurse midwife in Cottonwood, said that while she supports vaccinations for children she works with parents who are adamant against immunizations. Part of the reason, she said, is that some families in Yavapai County turn to alternative, natural methods to promote health and wellness, such as oils and herbal therapies. Among public schools statewide with 100 or more students in kindergarten, Camp Verde Elementary had the second-lowest rate of full immunization for MMR in 2013-2014, with Lake View Primary School in Page having the lowest rate at 76 percent, according to the Arizona Department of Health Services figures. Some charters schools with 100 or more kindergartners had lower rates. Nine percent of kindergarten parents at Camp Verde Elementary School claimed personal exemptions from immunization requirements, the state figures showed. Codie Athey’s sister, Marilynn Makinson, has a 10-year-old at Camp Verde Elementary who is vaccinated but shares her sister’s concerns about other children. “There’s a lot of kids out there that shouldn’t be getting sick, and these kids could be carrying some stuff that we can’t take care of,” Makinson said. Danny Howe, principal of Camp Verde Middle School and acting superintendent of the Camp Verde Unified School District, said he was unaware of the elementary school’s population of students who weren’t immunized. He said the school nurse is in constant contact with an epidemiologist to discuss emergency plans if a measles case were to appear in Camp Verde. “If there’s any concern … we’d meet to discuss plans of how we go about handling things with parents, the media and our other schools,” he said. Vaccine rates vary depending on where you live in the state. In Maricopa County, about 5.1% of parents opt out of the measles, mumps and rubella vaccinations. 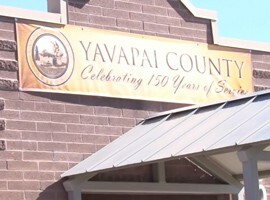 Yavapai County’s rate is nearly double. 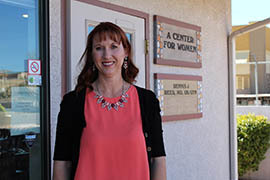 Stephanie Purinton, a certified nurse midwife in Cottonwood, said that while she supports vaccinations for children she works with parents who are adamant against immunizations.